London Transport makes it easy to get to the Tower of London. Several bus stops, a London Tube station and connection to the Docklands Light Rail (DLR). Most of these converge just to the North of the Tower of London. This is also where you can find remains of the great Roman Wall that surrounded the City of London. 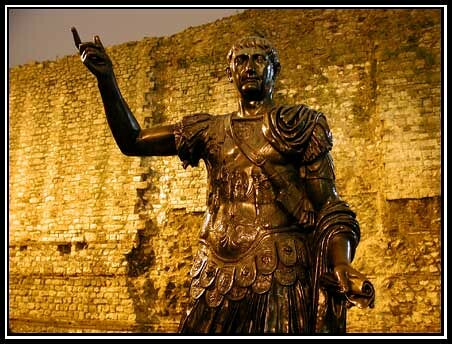 Nearly 2000 years ago the Roman’s occupied the City of London and made it a fortified walled city. It became a major center of trade. The wall was nearly 3 miles (5 kilometers) long and in places was 20 feet tall (6 meters). The City of London (not to be confused with London – see below) is still defined by where the wall was. So when visiting the Tower of London take a few minutes to explore before going in. Most people cross Tower Hill road by using an underpass. The wall, along with a statue of Trajan, is right next to this underpass. Also in this area is the Tower Hill Sundial. Along the perimeter is a history of the area starting with the Roman Conquest in 43 AD and the walls being built.